So I've been planning to have a big ol' Friday night fight between Fruttare and Fruti since before the summer even began. I first spied Fruti at Market Basket back in... gee, I don't even know now, April maybe? They were just kind of humbly sitting amongst all the italian ice and fruit bar products and I thought "gee, I've never seen these before". I went with the Caribbean Mix Fruit Bars because, well, I guess I was hoping for a nice fruit punch vibe. It's a fairly simple package that definitely has that small company feel to it. Unfortunately I left them sitting there in my freezer because we got buried by all the great free samples we got this year. It happens, I'm not proud of it, but it happens. 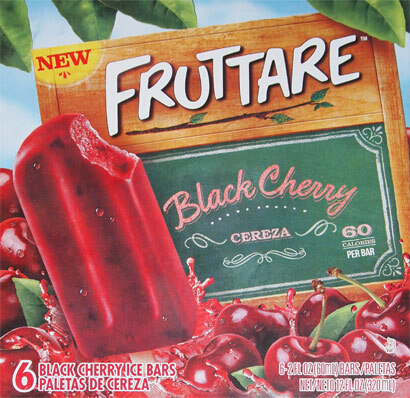 While that was all going on, I started seeing Fruttare bars pop up in stores and then eventually I started hearing those Ryan Seacrest advertisements for them. I felt like I was falling behind and that I should review them, but to be honest, I was having more fun eating ice cream and just wasn't ready to dig into any fruit bars. At some point I gave in and picked up the black cherry bars with the assumption I would mix them into my schedule. So months and months passed. At one point I tried the fruttare bar and it wasn't bad. At another point I got an email from Fruti asking me if I could check out their products. I said "good news, I already have a box!". I may have also said "A review will be up soon". Yeah, I shouldn't have said that. Whoops. Well here it is was August and I finally (officially) unwrapped these bars for the blog. One is a very traditional, manufactured looking product while the other looks like a start up product. 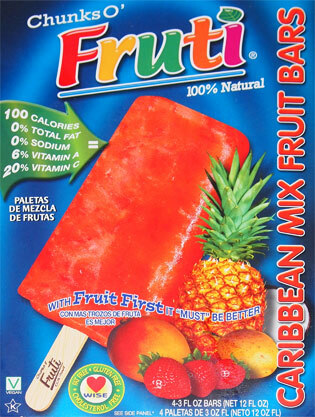 That said, you gotta love seeing fruit in both of them, especially the colorful variety in the Fruti bars. It was hard to see the size difference in that last shot, but as you can see now, one of these is a bar, and one is a brick. I don't mean that in a bad way, I'm just merely pointing out that this treat is not messing around. The only problem is, I left the Fruit bar in my freezer way too long. You might be able to notice the icyness in the photo. I hate when I let a treat sit too long, it's just not fair to pick on a texture that was probably caused by me. So no comments on them really, other then it was good enough that I will definitely pick up another box at some point, I'll just wait til I find a flavor that is a little more my style (you can see all the flavors here). 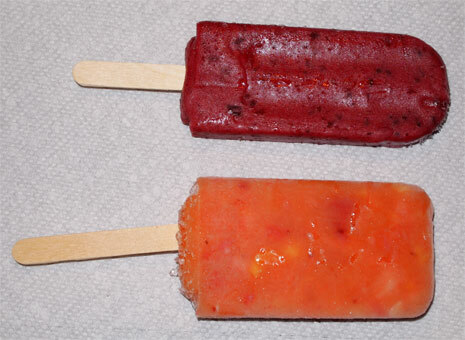 So I've had three fruttare pops now and they're decent, nay, they are good. I'm not sure why I started with the strong black cherry flavor, but I like them. My only real trouble is eating them slow enough. They are definitely more fruit than ice. The good news is that it's not an icy crunch, it's a somewhat squishy fruit bar bite. It's cool. I tried slowing down near the end and I even got a bit of a cherry pie vibe which was cool. If you dig fruit bars, I can't imagine you not liking these. I will definitely pick these up again as well and give you guys a more detailed review (maybe we'll do a couple of flavors in one post to keep it interesting). Ok, that's all I got, sorry for the half-reviews, but I just want to be fair to both companies. I'm comfortable enough to say don't be afraid to try these since I know I will be picking up a few more boxes once the mood hits. 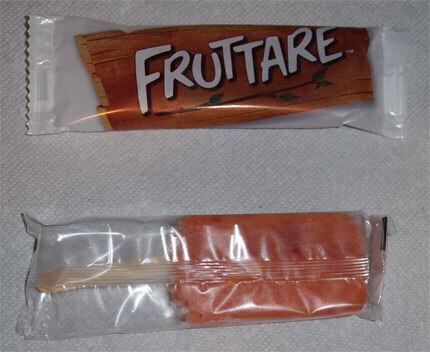 I've tried the Fruttare, and they were just "okay", imo. I guess I was comparing them to my favorite, helados mexico (http://www.heladosmexico.com/home.htm) which is more of a fruit and milk bar...so good...if you can find them, buy them. I believe they are in most Walmart locations, along with some Sams and Costco. I'm ok with ok, all depends what you are looking for. Whoa, it's been five years since I tried helados. Their lineup doesn't change much, but I should go back again.